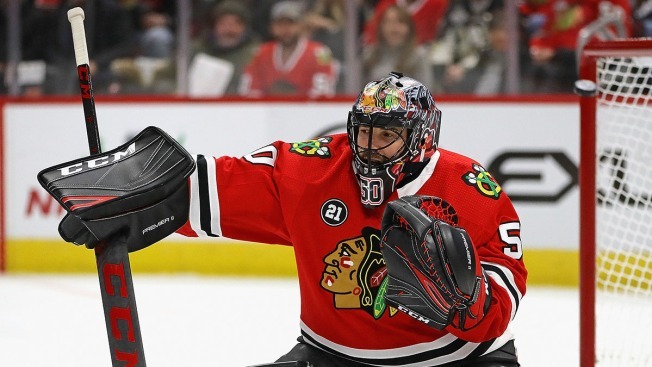 Crawford, who appeared in 39 games for the Blackhawks and posted a 2.93 goals against average and .908 save percentage, is one of 31 nominees for the award, which will be handed out at the NHL Awards on June 19 in Las Vegas. The King Clancy trophy is awarded annually to the NHL player who “best exemplifies leadership qualities on and off the ice, and who has made a significant humanitarian contribution to his community,” according to the league. No member of the Blackhawks has won the award, which was first given out in the 1987-88 season. Crawford is also the team’s nominee for the Bill Masterton Memorial Trophy, given to the player who best exemplifies perseverance and sportsmanship.